The Transportation Operations Division consists of Street Maintenance, Traffic Operations, and Forestry. The services provided by the Street Maintenance Section include repair of streets including potholes, curb repair, street sweeping and the maintenance of alleys throughout the City. A key function of this Section is to provide treatment of roadways and snow removal during inclement weather. The Traffic Operations System maintains the signs and traffic signals throughout Topeka. The Forestry Division is responsible for maintaining or removing trees in public spaces except for the parks, which are maintained by Shawnee County. Office hours are from 7:00am to 3:30pm Monday through Friday. For after-hours emergency response, call the City Call Center at 785-368-3111 or Police Dispatch at 368-9200. For after hours non-emergency issues, call 368-3803 and leave a recorded message. 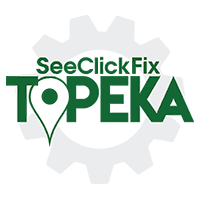 Connect with your local Government through SeeClickFix Topeka.